Derry City manager, Kenny Shiels and Dundalk boss, Stephen Kenny shake hands prior to Tuesday night's clash at Oriel Park. A DEFIANT Kenny Shiels has laughed off 'unbelievable' suggestions he is under pressure and is confident he'll lead Derry City into the 2019 campaign having 'worked miracles' during his reign as Brandywell boss. The Candy Stripes fell to a 17th league defeat of the season in the 3-2 loss against champions elect, Dundalk at Oriel Park on Tuesday night, despite a spirited second half comeback. The club is set for the worst league finish under Shiels as the Foylesiders currently sit in seventh spot - the position they finished the troubled 2015 campaign, although the City boss has managed to end a six year wait for silverware having won the EA Sports Cup. Shiels, however, has promised he won't stop until he's 'done the job right' and, while he admits it will be difficult to challenge the league's big spenders for the best talent, he has already identified players he believe will strengthen his squad. With the club failing to qualify for European football next season Shiels knows his transfer budget will be cut significantly but insists he's up for the challenge. "I'm here next season if I'm wanted and I'm sure I will be wanted and that's not being big headed," said Shiels. "Next season, if we could just say, 'right let's go and get the top players' and I've identified a few I'd like to go and get. We need some experience along with the youth. "If we don't get into Europe and catch St Pat's and Bohs then our budget will be cut and that's to be expected. I've worked miracles most of the clubs I've been at and I've worked miracles the last two and a half years - I know I have because where we've come from and where we've went to. To qualify for Europe in the last two years has been a fantastic achievement." "It's a really difficult job but I'm up for it," he stressed. "I know Stephen (Kenny) was under pressure because he hasn't won a trophy in well over a year. That's what they say about me up at my place; 'Kenny Shiels under pressure'." he laughed. Unbelievable!" "I've the best chairman you could ask for. I have to be honest and open about the situation and I'll not stop until I feel like I've got the job done right until they say they want to bring someone else in and then that's fair enough. But hopefully that's not for a few years yet." There were four ex-Derry City players involved in Dundalk's team on Tuesday night with Patrick McEleney and Michael Duffy starring while Dean Jarvis and Georgie Kelly also played their parts. 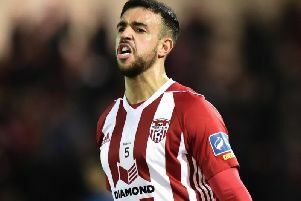 And when Shiels was asked if he would be interested in bringing another former Candy Stripe back to Brandywell next season in the form of Barry McNamee, who isn't expected to sign a new deal with Cork, the Derry boss said he would be 'very interested'. "I would be very interested in Barry McNamee. He's a local lad. He's from Ramelton. Definitely I would be interested in Barry but that's from left field and it's according to whoever else is interested. If Dundalk and Rovers and Waterford are interested then it's going to be very difficult for me to get him. "We lost four players to Cork last year,. This sounds negative but I have to explain the situation. You've got the big spenders, Cork and Dundalk and Waterford and Shamrock Rovers. Those four in particular are big spenders and then other clubs have a fantastic location and infrastructure like Bohemians. Bohemians made 11 changes from the team which played us the other night - that's an example of the depth of their squad. "We can't do that. We're down to 17 at the minute and that's with five development players but we're still battling away. We expect to go close to winning our last four matches. if we keep progressing the way we are."